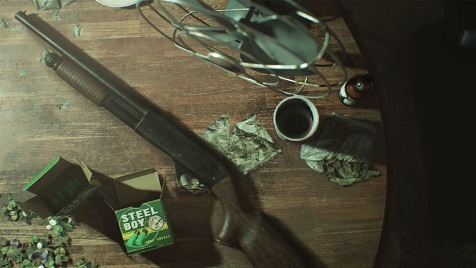 There are seven weapons that you’ll find in the Resident Evil 7. With them you can maximize your chances of survival a bit, but be careful, because there are a few arms that you could miss. Not all of them are part of the story and can easily be unnoticed. These include the Magnum, the rifle and the grenade. In this guide, we will show you the locations of the individual weapons in RE7. Knife: The first weapon in our list is rather something for friends of proximity. You get the knife from the policeman quite early in the game. It doesn’t do much damage, but you can destroy crates and kill insects, especially in the later game, so you don’t get any valuable ammunition. By the way, you can secure a success right away. Pistol: The pistol is the first weapon you can get in the game. So far there are probably two different types of the hand held firearms (Colt M1911 / Glock). The gun is pretty weak, but you can shoot fast. Don’t be surprised, that sometimes a few headshots have to be before a monster falls. The Colt M1911 A you can assemble your own. Rifle: In the entrance hall you see a statue holding this. However, you cannot collect it right away, since a mechanism is triggered by which the door closes behind you. Wait until you get the scorpion key, then go to the main house and into the grandmother's room. In the room you can find a damaged shotgun. Then she exchanged the rifle of the statue. Another "exchange object" you find in the attic. There is a dummy gun, which you can also exchange. The shotgun is very strong, but it takes a lot of time to recharge. Magnum: The Magnum you get when you put nine antique coins in the bird cages. In store room you can find the cages and have a very powerful weapon with the Magnum, whose ammunition is very rare. Machine Gun: During the mission on the ship you cannot miss the machine gun and unfortunately you can only use it there. It causes little damage, but it is very fast and you have 64 shots. Flamethrower: The flamethrower is also part of the main missions and you will be able to build it in the old house. It is the perfect weapon against insects, but you shouldn’t use it against molded because its range is too small. Albert 01: The Albert 01 is probably the most powerful weapon in the game and you get it automatically for the last boss fight. Once you have completed the game, the Albert-01 is packed into your Item box and you can use it elsewhere.